1403c, Used Rims, 15X6, 5 LUG, 4-1/2, 84-02, JEEP, WRANGLER, CHEROKEE, COMANCHE, WAGONEER, TRUCK, S.W., KHAKI, 9 SLOT, CHROME, STEEL. 145, Hubcaps used, 15", 84-89, AMC, JEEP, CHEROKEE, EAGLE, J-SERIES TRUCK, WAGONEER, 9-SLOT TYPE, BRUSHED FINISH OUTER RING, MEDIUM GREY WITH BLACK POCKETS, BRUSHED CENTER, 5 LUG NUT HOLES, METAL CLIPS. 3261, Hubcap USED, 15", 64, CHEVY, CORVETTE, CHROME, 9 SLOT TYPE, WITH SPINNER. 3264, Hubcap used, 13", 63, CHEVY, CHEVY II, 9 SLOT, 3 SPOKE WITH RIB TYPE, WORD CHEVY, CONE CENTER. 3266, Hubcap used, 14", 63-64, CHEVY, CHEVY II, SS HUBCAP, POLISHED CAP, 9 SLOTS, 3 SPOKES, SILVER PAINTED RING, STEPPED CENTER RAISED WITH RED SS BLACK AND CHROME BACKGROUND, METAL CLIPS. 330, HUBCAP USED, 14", 1968, PLYMOUTH, PASS, CHROME OUTER RING, SPECKLED BLACK & GREY, 9 POCKET, BLACK IN POCKET, 9 SLOT TYPE, CHROME CENTER WITH WORD PLYMOUTH DIVISION, METAL CLIPS. 343, Hubcap, 14", 69, PLYMOUTH, BARRACUDA, PASSENGER, 9 SLOT TYPE. 4030, Used Rims 16X6-1/2, 5 LUG, 115MM 97-00 BUICK REGAL, 9 SLOT, BRUSHED ALUM. 4031, Used Rims, 16X6-1/2, 5 LUG, 115MM, 97-04, (BUICK Regal ) CHROME ALLOY - 9 SLOT. 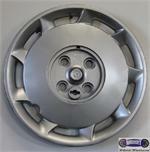 55075, LEFT Used Hubcaps, 14", 90-91, HONDA, PRELUDE. 9 SLOT HUBCAP PAINTED SILVER. CENTER SOLD EXTRA. FOR LEFT SIDE. 56005, HUBCAP USED, 14", 90-92, ISUZU, STYLUS, IMPULSE, PAINTED SILVER, 9 SLOT TYPE, ENGRAVED WORD ISUZU IN CENTER, 4 BLACK FAKE LUG NUT, PLASTIC CLIPS & WIRE RING. 6012, HUBCAP USED, 15", 00-02, SATURN L SERIES, SPARKLE SILVER, 9-SLOT. WITH RAISED CENTER NO LOGO, & 5 LUG NUT CAPS. HELD ON BY LUG NUT CAPS. 61520, HUBCAP USED, 13", 91-93, VW, FOX, PAINTED SILVER, 9 SLOT. SMALL LOGO ON OUTER EDGE OF CENTER, PLASTIC CLIPS & WIRE RING. 7003, Used Rims, 15X6, 4 STUD, 100MM, 92-93, SATURN, SL2. ALLOY 9 SLOT, POLISHED.